On the Ontario coast of Lake Huron, Boiler Beach is famous for its lovely sunsets and great swimming. 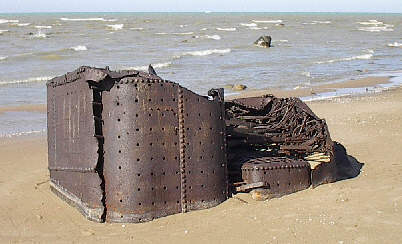 The beach gets its name from an old ship's boiler that has rested in the same spot since 1883. Prior to that date, the boiler was part of the power-plant for the steamship ERIE BELLE, a tug that had also been a passenger/cargo ship. She exploded in the winter of 1883 while trying to rescue a schooner (the J. N. CARTER) that had gone ashore during a terrible storm. The blast killed four of the twelve men on board ERIE BELLE and utterly destroyed the ship itself. The wreck of the ERIE BELLE is one of the most visible shipwrecks on the Great Lakes, and yet the physical traces of this 19th century steamship seems almost obscure and abstract. All that remains is the boiler, sitting a few dozen meters off shore, 3 km south of Kincardine, Ontario. It is indeed ironic that the cause of the wreck of the ERIE BELLE was also the only trace that now remains of her. The boiler has even lent its name to the whole location - Boiler Beach! The ERIE BELLE has also lent her name to a fine sea food restaurant in Kincardine, Ontario. Be sure to drop in if you're anywhere near. The ERIE BELLE was built in 1862 as a steam-powered, wooden-hulled tug, and was originally named the HECTOR. She was built at Peck & Masters of Cleveland, OH, and was 112 feet in length, had a beam of 20 feet and a hull depth of 9 feet. She was registered as 221 gross tons and 111 net tons. 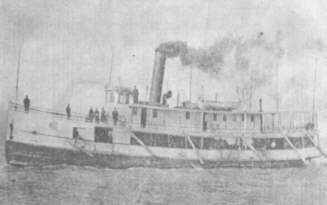 During the American civil war, the HECTOR operated as tug on the Great Lakes, moving large quantities of material by towing either barges or sailing ships. Some time after the war she was re-built as a passenger ship, and served the ports at the western end of Lake Erie, including Leamington and Pelee Island. The ERIE BELLE as she appeared in 1879, configured as a passenger and cargo ship.